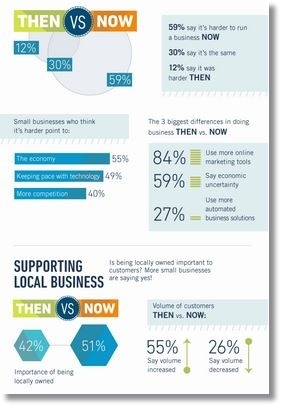 Small Business Infographic: "Business Got Tougher AND More Rewarding"
Small business Infographic: Small Business never had it easy, and with new business tools, clouds and marketing and engagement platforms and technologies entering the fray at a dizzying rate, it’s certainly not a mystery why nearly 60% of small business owners say it’s more difficult to manage and operate a small business today than just five years ago. The above insights derive from a new survey dataset from email marketing Cloud-SaaS provider Constant Contact, brought to our attention by HubSpot. The Constant Contact survey polled nearly one million small business owners to relate how managing their small business today differs compared to just 60 months ago.